Last season went about as well as the Portland Trail Blazers organization and fans could have hoped. The team immediately outperformed preseason expectations with a 17-3 (and then 31-9) start to put itself in excellent position to grab a postseason berth. A rough March kept them from nabbing homecourt advantage in the first round, but a thrilling six-game victory over the Houston Rockets — capped by Damian Lillard's series-ending buzzer-beater — ensured that the Blazers could look at 2013-14 as a massive success. Over the course of a few months, a team thought to be in rebuilding mode became able to entertain challenging for a conference title. This is absolutely a good position for the franchise, but it also presents new challenges as head coach Terry Stotts and his players attempt to build on the gains of last season. The Blazers added several players who should improve a previously thin bench, but they remain heavily dependent on their starting five. Plenty of teams find themselves in the same situation, but few contenders take it to the same extreme as the Blazers. 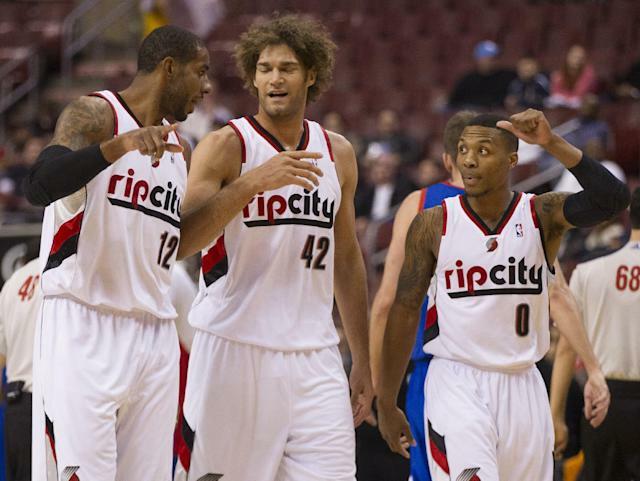 They will go as far as Damian Lillard, Wesley Matthews, Nicolas Batum, LaMarcus Aldridge, and Robin Lopez take them. Those players are very good, to be fair. Lillard is coming into his own as a star, Matthews is one of the best two-way shooting guards in the league, Batum is effectively the same thing as a small forward, Aldridge was the best player on either team in the Rockets series, and Lopez defends well enough to allow his frontcourt mate to focus on his scoring. In fact, they were one of the best five-man lineups in the league (especially when adjusted for total minutes played). Even if the Blazers are especially dependent on this group, they at least know where to turn when needed. Stotts doesn't have to think especially hard in crunch time. It remains to be seen if that reliance on a handful of players gets Portland in trouble due to injury or any other prolonged absence. Though I'm sure they'll take their chances after finding such fine form a year ago. Ahead of schedule, then a reality check, then ahead of schedule again. Yes, because the Blazers added several veterans who should bring some stability to what was one of the league's worst benches. Steve Blake should serve as a capable backup for Lillard and even team with him in some cases, while center Chris Kaman can provide an offensive threat that Lopez mostly lacks. Portland could have used a pick in June's draft to add some wild cards into the mix, but the summer could lead to gains for shooting guard Will Barton (one of the team's few bright spots in the Spurs series) and C.J. McCollum, whose rookie season was derailed by injury. Kaman did not prove to be an especially good replacement for Dwight Howard with the Los Angeles Lakers last season, playing in just 39 games with an average of just 18.9 minutes per contest. He was quite effective when he did play, though averaging 10.4 points and 5.9 rebounds per game. Those are numbers that the Blazers would welcome, particularly given their reliance on Aldridge for post scoring. If Kaman can stay healthy — a tall order, given that he hasn't played 70 games since 2009-10 — he could reshape Portland's scoring options. If for some reason you just jumped to this section, here's some news for you — Portland had a really bad bench in 2013-14. It should be a little better this season due to the additions of Blake and Kaman and the presumed improvement of Barton and others, but the Blazers are at considerable risk of an injury to one of their starters turning the season into a trying one. The Blazers did so well last season that it's hard to say anyone enters 2014-15 needing to prove themselves in order to stave off serious criticism. Rather, the issue will be sustaining the performances of last season. Of the Blazers' main players, Lopez would seem to have the toughest time repeating his strong play. Lopez joined Portland having started 82 games for the New Orleans Hornets the year before, but he improved considerably last season with a big bump in rebounding (from 5.6 to 8.5 per game) while playing major minutes for a playoff team. Lopez is somewhat rare for a defense-first center in this area in that he is better on the ball than in help, but his presence allows Aldridge to focus on what he does best. It's not entirely clear if he can be as effective this season as last, but, like many Blazers, there's also a decent chance he'll get better. Lillard has already broken out — he's now a star with a broad media presence and reputation as one of the NBA's best end-of-game shooters. But a quick glance at his stats shows that he actually has some room to reach another level of stardom. Lillard got better in his sophomore season, seeing boosts in per-game stats, per-minute numbers, and every commonly relied-upon advanced metric. But he can get better as a facilitator, score more, and generally affect games in the manner of a veteran rather than an up-and-coming talent. 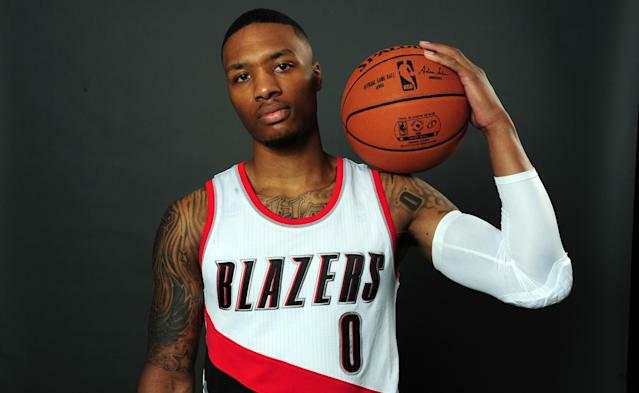 Simply put, this could be the year in which Lillard is automatically identified as one of the best point guards in the world. "Is" can replace "could be." The starting five stays healthy, Lillard ascends to another level, the bench becomes functional, and the Blazers make it all the way to the conference finals. Lillard or Aldridge misses a considerable amount of time, another starter does the same, the bench doesn't get better, and the Blazers narrowly miss out on the playoffs in a hyper-competitive conference.